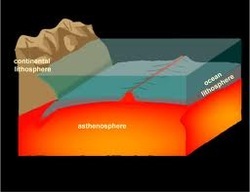 Plates Tectonics is a scientific theory that describes the large-scale motions of Earth's lithosphere. 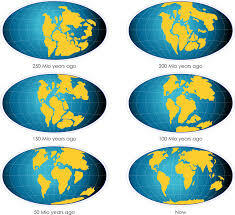 The model builds on the concepts of continental drift, developed during the first few decades of the 20th century. The geoscientific community accepted the theory after the concepts of seafloor spreading were developed in the late 1950s and early 1960s. Continental Drift is the movement of the Earth's continents relative to each other by appearing to drift across the ocean bed. The concept was developed by Alfred Wegener in 1912, but his theory was rejected by some for lack of a mechanism. The idea of continental drift has been replaced by the theory of plate tectonics, which explains how the continents move. 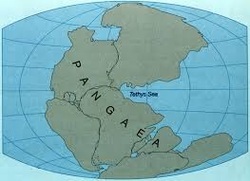 Pangaea was a supercontinent that existed approximately 300 million years ago. It began to break apart around 200 million years ago. 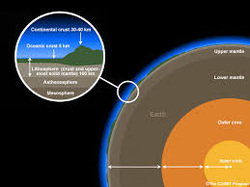 The asthenosphere is a part of the upper mantle just below the lithosphere that is involved in plate tectonic movement and where convection occurs.